I have some of the same feelings I had about Shotgun Lovesongs. I really like how Butler dismantles the stereotypical notions of manhood and masculinity in his stories. And he is a fantastic storyteller. I never felt the pace lagging or any unnecessary meandering in The Hearts of Men. Each section is purposeful to the overall story and message. That said, the beginning is stronger than the end, mostly because the main characters, Nelson and Jonathan, seemed so fully realized and lively as children but became flat and somewhat generic in later sections as adults. Perhaps that was intentional, though? Is Butler trying to make a point that we lose something, some spark, as we age? I’m not sure—possibly, or it could possibly have been the narrator’s interpretation didn’t handle the jumps forward in time so well for me. I liked Rachel, Jonathan’s daughter-in-law, but I would have liked her to have been more realistic and more three-dimensional—Butler had a similar issue developing women characters in Shotgun. In this story, women are central to the hearts of these men, after all. 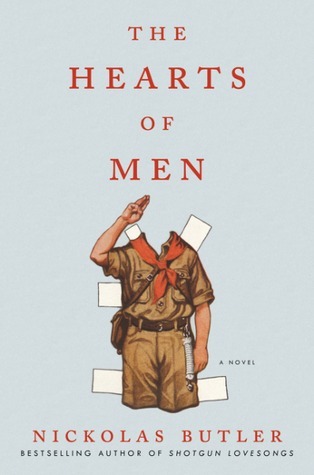 Ultimately, The Hearts of Men is a story about boys becoming men, fathers and sons, bravery and decency, how both romantic and platonic relationships affect you, and the ubiquity of being a flawed human. Butler has a sensitive voice and his storytelling is immersive, and I’ll definitely look forward to his next book. Listened to audiobook in May 2017. This entry was posted in books and tagged audiobook, contemporary literature, drama, family, fiction, friendship, literature, love, male adolescence, midwest by kristin @ my little heart melodies. Bookmark the permalink.